Get your team into the Spring Fundraising Open Am-Am now! 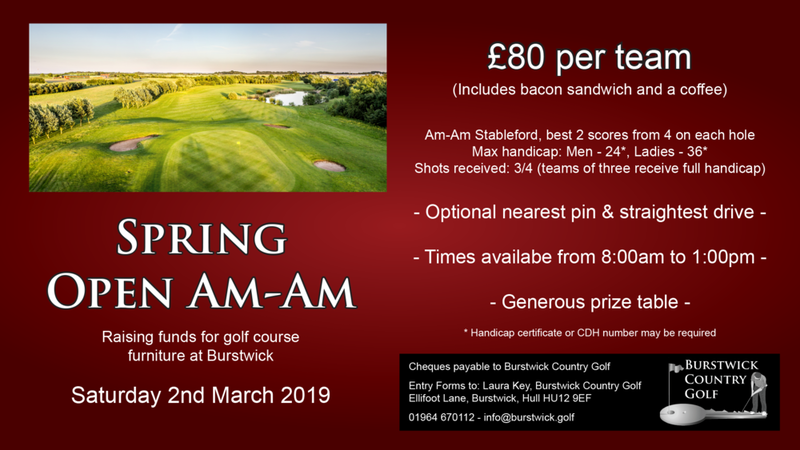 On Saturday 2nd March 2019 we are hosting our Spring Open Am-Am which will be raising funds for course furniture, such as new benches, bins, ball washers and more. Anyone can enter as long as they are a member at any golf club and have a valid CONGU handicap. Entry costs just £80 per team and our prizes are very generous considering it is a fundraising event. The format is an Am-Am Stableford with the best two nett scores to count from the team on each hole, and teams are allowed 3/4 handicap allowance. Tee times are available from 8am to 1pm but generally book up very quickly so make sure to get your team in soon. To put your team in the event please book online here or call us on 01964 670112.